Goldsmiths Design’s first class of MA Fashion students are just getting to know each other, and what better way to bond than working together? For their first brief, Connections,the students brought old clothing items they no longer wear and stitched them together into a quilt that will be officially presented to the world on Friday. The project is part of the course’s focus on sustainability and its definitions for this term. Thus, the students and their teacher, programme leader Ruby Hoette, have been hard at work all week in the CAL exhibition space on New Cross Road, cutting and sewing together old denim clothes and sharing stories and inspiration. 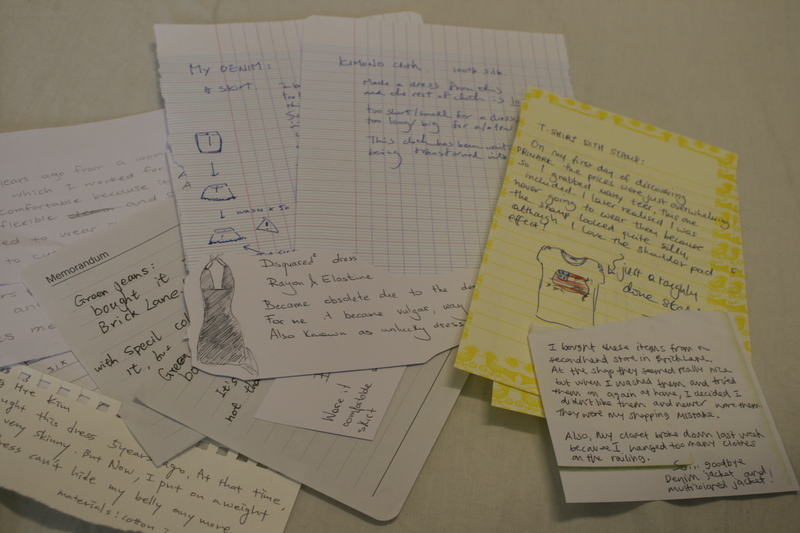 Every clothing item in our wardrobe has a story, and so did the ones that were sacrificed for quilting purposes: written on pieces of paper, they were interesting samples of the way our tastes and perception of personal style changes over time. Incidentally, this year’s group of students is all-female (although male students were and will continue to be welcome to apply! ), which brought on a conversation on gendered perceptions associated with activities such as sewing and knitting and the way they are taught to children in schools; those present, coming from different countries, shared their experiences. Manual work, intellectual stimulation and an open, friendly atmosphere: the class seemed to be engaging on all levels. You can see more photos of the MA Fashion people at work here on our Facebook page. And if you’re looking for more information on the course, read (or re-read!) our extensive interview with Ruby Hoette here.